Well, it’s official. Lawn mowing season has begun. While this is certainly not a favorite job for most homeowners, it is an essential component of lawn care. Not only does regular and proper lawn mowing help keep your lawn looking great, but it also helps to keep your lawn healthy and eliminate some of the pests that can infest your lawn. To help get the most out of your lawn mowing, we here at Ascension Parish’s go-to lawn care company—Royal Estates Lawn & Landscape—would like to share with you some tips on mowing your Louisiana lawn. While not all types of grass have the same care and maintenance requirements, below are some general tips that apply to most all lawns. To really maximize the performance and results of your lawn mower, it is essential to keep your blades nice and sharp. When your lawn mower blades are dull, the blades of your grass will be ragged and likely brown at the edges. Doing this regularly can weaken your grass, making it more susceptible to disease, drought, and pests. 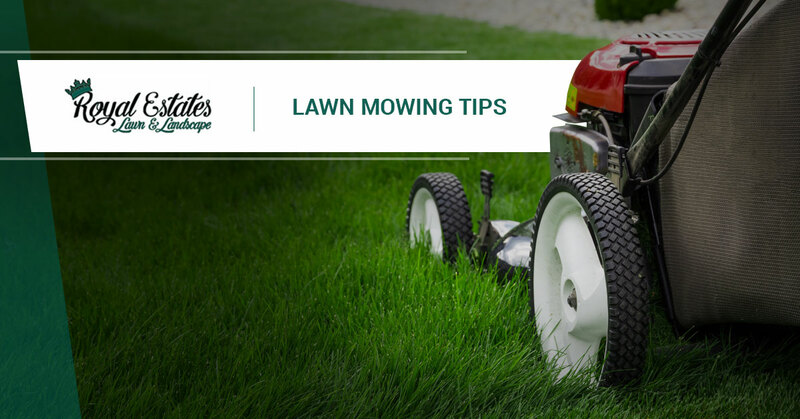 A simple tune-up along with a blade sharpening will help your mower perform optimally and improve the appearance of your lawn. Each time you mow, alternate directions. If you cut in the same direction every time, the growth habits will adjust to this and begin to grow in the direction you mow. Additionally, by varying your mowing pattern, you can avoid the formation of ruts. The ideal time to mow is on a dry day in the early evening. When you mow at the hottest time of the day, this can be hard on your mower and lawn. And mowing when it is wet can result in an uneven trim. Additionally, wet clippings can not only be hard on your mower, but when left on the lawn, they can smother grass and cause brown spots. Some clippings are good for your lawn. They break down quickly and return nutrients to the soil. If you mow on a regular schedule, you shouldn’t have to worry about large clumps of clippings forming in your yard. And if you do insist on raking and bagging up clippings, remember that they make great additions as mulch or compost—as long as you haven’t used and lawn or weed control products. It’s important to always practice mowing safety. When using a push mower, this includes wearing closed-toe shoes—never flip-flops or sandals—and eye protection. Also, avoid pushing the mower backward, and when mowing down a slope, move from side to side rather than up and down. This will prevent you from slipping and falling. Hate Mowing Your Lawn? Don’t Do It! There are few summer jobs worse than mowing your lawn. If you are dreading this summer job, trying to think of ways around it—no, trust us, it is not a good idea to do a controlled burn on your yard—there is a solution: Royal Estates Lawn & Landscape mowing services. We can handle all of your lawn mowing services. Whether you need regular bi-weekly cuts or monthly cuts, we provide Ascension Parish with reliable, consistent, and professional mowing. Learn more here and contact us today at 225-372-7937 with any questions or to schedule your lawn mowing service.